School may be out, but never fear—there are plenty of teachable moments to be had when it comes to kids' financial literacy. There are lawns to be mowed and summer jobs to be had—but parents also can go a long way toward helping children learn about money with a simple tool: the allowance. Dungan suggests starting an allowance when a child is just 5 or 6, increasing the amount each year. "It's a great opportunity to delve into it, transfer some responsibility and work on things like deferred gratification," he said. Tying an allowance to chores diverts the focus on to the completion of the work, Dungan adds, so he recommends straight cash. And rather than just handing out money, he says an allowance should be a springboard for conversations about spending, saving and giving—and that kids should be taught to do all three. This time of year, Dungan says parents can try giving teens responsibility for back to school shopping. He suggests giving a teen a budget—whatever you are allocating for fall clothes and school supplies—and tell him or her to figure out how to make it work by shopping around and deciding what's necessary and what's not. "A lot of things you're spending money on for your kids, there's no reason you can't have your kids do that," he said. Allowances, he said, "transfer accountability and responsibility." Others, though, beg to differ. Lewis Mandell, the former dean of SUNY Buffalo's business school and a financial literacy expert, has researched the impact of allowances on financial behavior later in life, and says the results are troubling. 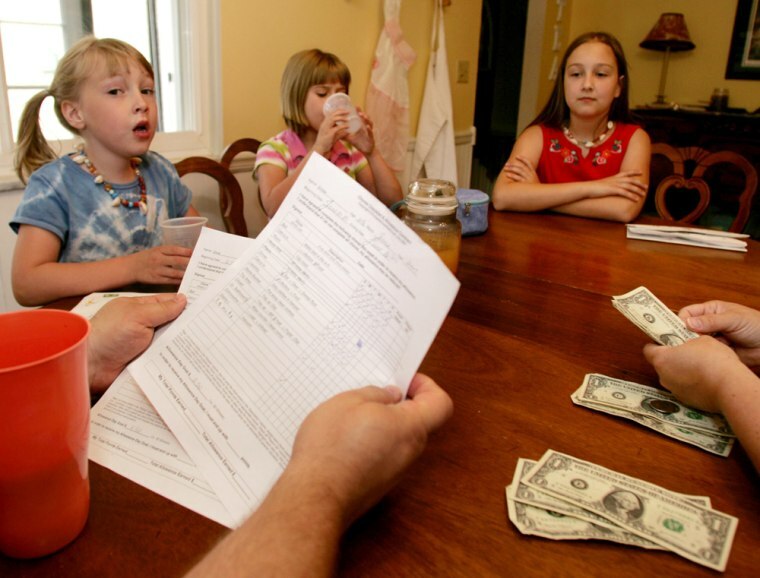 His initial premise, he said, was "that kids who had a regular, nonconditional allowance, who could reasonably budget their allowance, would probably have the highest financial literacy scores," he said. "Well, it turned out they had the lowest." Kids who received an allowance in exchange for chores scored slightly better, but the top performers never had allowances. The pattern continues into adulthood, Mandell says. Studies by fellow researchers "showed that kids who got regular allowances were less likely to value the inherent nature of work. They were more likely to be what we would call slackers." The good news, Mandell says, is that the solution to the problem is simple. If parents communicate with kids about the allowance, and explain the importance of saving and deferred gratification, those few dollars per week can provide an important life lesson. "When kids don't have the opportunity to interact with their parents and learn about their obligations as a citizen of the household, then they lose out," he said. But "some of these interactions can be very valuable." Mandell also advocates allowances tied to chores. "Associating payment with the performance of certain work is setting in my mind what is a useful association," he said. And for older teens, Mandell says being responsible for back to school shopping or a clothing allowance can be terrific, potentially teaching them how to budget and save and hold off on impulse shopping. Be careful, though. If your child runs through the money, you may feel compelled to bail them out—and then the lesson is lost. "An awful lot of it," Mandell said, "is sticking to your guns." Could your belly prevent you from getting a job?